Pellets are a formulated diet for our parrots, much like the kibbles our dogs and cats are given, but specific to the needs of parrots. They contain grains, seeds, vegetables, fruits and proteins with added vitamins and minerals. The ingredients are mixed, and then baked. 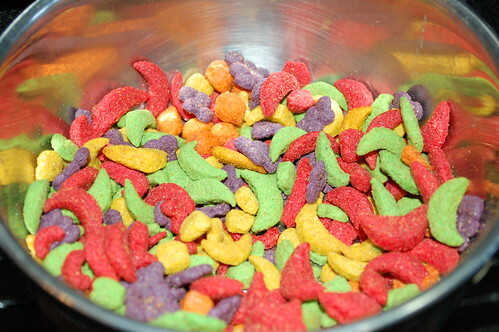 Some are made into shapes, dyes and sugar added. Some of them contain only organic ingredients and human grade grains. None of them are complete. We can send a man to the moon, but we can’t duplicate a parrot’s natural diet. Which pellets do I feed my parrot? Different species have different requirements. A macaw needs a diet higher in fat and lower in protein, a cockatoo requires the exact opposite, though many pelleted diets will feature both a macaw and a cockatoo on its packaging indicating that it is the right food for either. There are no species specific formulated diets on the market today, but an organic or natural pellet is always preferable. If your parrot has any history of liver problems, stay away from the colored pellets. 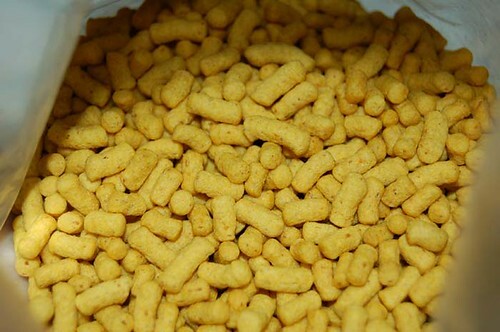 Pellets should be offered in conjunction with fresh fruit and vegetables, cooked grains and pasta, tubers and legumes. Sprouts might be the healthiest thing we can offer to our birds. A seed or grain expends its fat reserves in the process of sprouting and the end result is a living plant that offers more nutrients than just about anything else we can feed them. 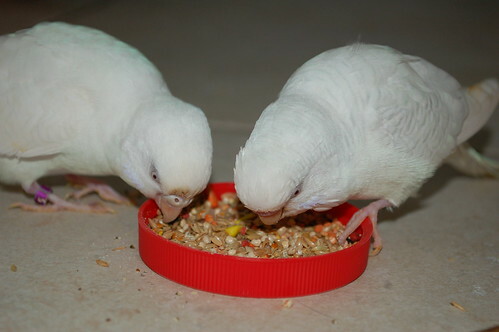 I offer seed to my cockatiels as a large part of their diet, and my bigger birds are offered seeded treats, like Nutriberries. Pellets should be used as an addition to an already great diet, in the case of some of my picky eaters, I rely on the pellets to balance out their diet when they flatly refuse to eat the good stuff I give them. You aren’t alone. Many people who have brought home parrots that were on seeded diets have found it very difficult to convert them to a fresh foods and pellet diet. Upgrading them to a better quality pellet might present the same problem. Hiding the pellets in foraging toys has been helpful in introducing the idea of them to skeptical parrots. When a pellet is where a treat usually is, it might be sampled. Another thing to consider is: does your parrot recognize it as food? You might want to mix it in with the other foods that you offer to get that point across, or play games where you pretend to eat one in front of him and make a big deal about how yummy it is. You can play the “you can’t have this, it’s mine” game. A parrot wants anything that belongs to you. Do I have to offer pellets? There are a number of parrot owners I know that don’t use pellets at all. The idea that nature doesn’t provide a pellet tree is a compelling argument. If your parrots diet is so good and so complete that they don’t need the dietary backing of a pelleted food, then you are doing a wonderful job. Not having a dish of pellets in all of my cages makes me nervous, personally. But, your house, your rules. *For the parrots I use Higgins Mayan celestial blend besides the fresh veggies and fruit. I use low iron soft bill pellets for the aracari as her proteine source but otherwise an all fruit diet. 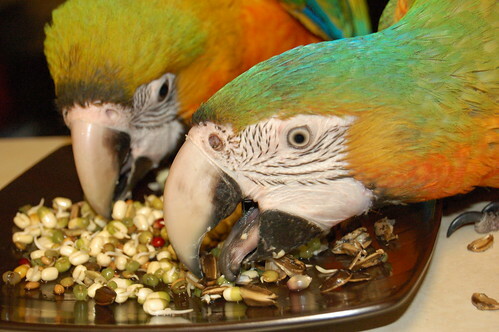 *Syd (greenwing macaw) will only eat the Kaytee exact rainbow pellets, Cassie (goffins cockatoo) also. Stella (umbrella cockatoo) eats the Zupreem fruit blend. I am working on switching them all to the Zupreem natural to get away from the colors. The amazons eat the Kaytee original. Little ones wont eat pellets. Each bird, depending on size is offered from a dozen to 2 dozen pellets daily along with their veggies, seeds, and things. *I mix one 5 lb bag of Roudybush to 50 lbs of a natural seed with no dyes. I like Roudybush because of the ingredients and nutritional value, not to mention it also contains no dyes. It tastes good too apparently…I’ve never had an issue getting a bird to try it. I’ve been researching cockatiel diets for almost two years now…and 10% pellets to 90% seed mixture with daily fresh veggies, twice weekly sprouts, and once weekly egg with cheerios or rice krispies seems to be as close to a perfect diet as you can produce in captivity for them. I understand most people here have big parrots…but this is what I feel is the best for my little guys. 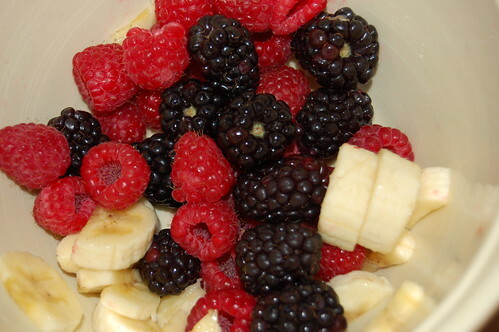 *I buy Zupreme Fruit and Natural and mix them. Chicken (moluccan cockatoo) refuses to eat the purple ones, Daisy (greenwing macaw) will alternate between the fruit and natural. One time she’ll eat all fruit, the next time she’ll eat all natural. I never know. My guys aren’t fans of fresh food so they get pellets so I’m sure they eat. *I keep some pelleted food around and feed some once in a while more as a prevent emergency starvation thing here in Hurricane Country. Hagens natral or Zupreem natural, I am not a proponent of pelleted foods. Feed a fresh seed and sprout mix with chopped veggies and fruit with either some Walnuts, Almonds Pistachios or Pine nuts every day here. Scrambled eggs once or twice a week and a warm mash mix at night just as a bonding thing and to make it easier to medicate if needed. I know spoiled-well maybe a little. Finally, I want to add that I have actually eaten a pellet. I was motivated to do this by the smell of the Zupreem fruit blend. They smell like Fruity Pebbles and I had to know what they tasted like. I chose an orange one. For my life I don’t know what they do to make them smell like that because the taste of it doesn’t correspond. It wasn’t horrible. It seemed fresh, but tasted bland and not at all sweet. I wish I had another brand on hand to compare it to at that time because I don’t know if whatever struck me to do that then will ever strike me again. my cockatiels are ok with pellets, but my indian ringnecks dont really like them. one of my ringnecks eats anything and everything, except pellets. Hi Rychele, It is a frustrating problem. My goffins cockatoo does the same thing with her organic pellets. She likes the texture of them and is more likely to use them as a toy than other pellets. I do know she eats them as well, but I don’t know how many. I deal with this in two ways with her: 1) I limit the amount of pellets she gets in the hopes that she will be less likely to waste what isn’t abundant… and 2) I have positioned her bowls and perches in such a way that she has to “powder” her pellets over her fresh food bowl (no perch by pellet bowl). 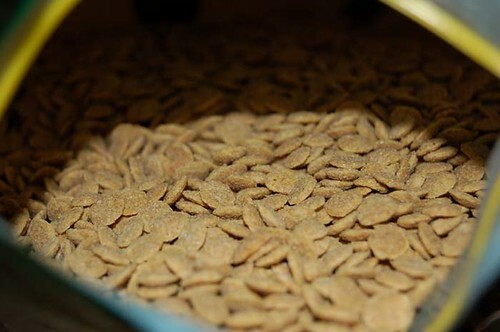 That means that when she eats the fresh foods, a sprinkling of pelleted food is over them. That way I worry a little less about what she has eaten. Hang in there. Playing with food comes before eating it sometimes. Half the battle has already been won. Many parrots do not eat pellets because they don’t recognize it as a food. Your bird may already be eating more than you know. What I wonder is how do people really know what a good diet is for their parrot? There is barely enough research done about their natural diets and their captive diets aren’t even close to imitating the natural ones. So when one person says I prefer to feed X kind of pellet and someone else says they like to feed Y, what is all of this based on? Does anyone really know or are these based on personal opinions and guesses? You said that “Pellets should be offered in conjunction with fresh fruit and vegetables, cooked grains and pasta, tubers and legumes. Sprouts might be the healthiest thing we can offer to our birds.” Once again, I am just curious what this is all based on? Is this because that is food you consider to be healthy for humans or is there a reason you think parrots need to eat all of that? Parrots are multi-eaters and can get by on many different kinds of foods, so I bet it can’t hurt them to offer them variety. Obviously we are trying to offer them the healthiest variety so how do we know where to start? Why aren’t you discussing Harrison’s pellets? They are heads and tails above the rest, not baked, but fresh extruded. Dr. Harrison has a lot of credibility. Hi Mary, My intention was not to exclude Harrison’s, it simply was not named by the people who responded to my survey. It is one of the best pelleted diets available. I have been doing research on Harrison’s for a bit but haven’t gotten all of the facts straight yet. It is extruded, but it is toasted first from what I have learned, but that could simply be because soy needs to be heated to remove an enzyme that is detrimental to birds. It also includes clay among the ingredients, which a large variety of both new and old world parrots benefit from. I am looking for answers as to which parrots don’t go to clay licks and why. I still have a lot of questions, and information is scarce. Dr. Harrison has my complete respect and has created a very good product. I am just waiting for someone to create a perfect one.